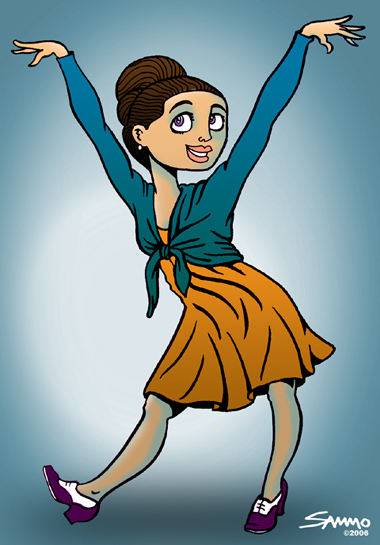 My contribution to Illustration Friday's "dance" topic. Inked with a Sakura pigma brush pen and colored in Photoshop. love the colours you've used and the effects for the light and shaddow - nice clean work, nice character too!! Neat illustration ... she reminds me of someone - maybe just a bit of Audrey Hepburn? By the way, your "guerilla art" is wonderful! This is great, I really like the colours and the way you have used blue for the shadows. Hey SPUNKY. What a nifty pose! Nice colouring and great pose! quite the pose! nice work.